Groovy Girl was confirmed yesterday. It was a beautiful service with lots of emotional moments. 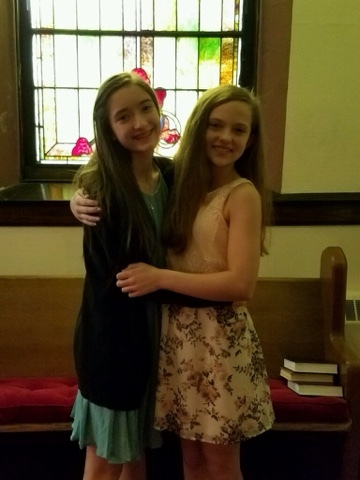 Six confirmands-all girls-have had a year of classes filled with interesting discussion. A few girls-including G.G. were able to take a trip to Nicaragua to deliver shoe boxes filled with school supplies to children. They've had overnights, a ski trip and a June mission trip to W. Va still to come. Most of the girls have grown up together in the church. It is still difficult for me to wrap my brain around the fact that my baby is 13, confirmed, will soon take driver's ed, and will be in 9th grade. Crazy. Seriously. She was a miracle baby, born early, but oh, so healthy and rambunctious. Effervescent as her youth director described her. To celebrate her and her best pal, Katy, I hosted a brunch for family friends including our minister and his wife. Impressively ALL my dishes turned out amazing. This does not usually happen for me. I have best intentions but things fail, fall, or just don't work. This all worked and they were new recipes so if I can do it; you too could make these brunch happy recipes. Groovy Girl loves breakfast food so brunch was the perfect choice even though it was 1:30 in the afternoon. I picked two dishes and two side dishes. 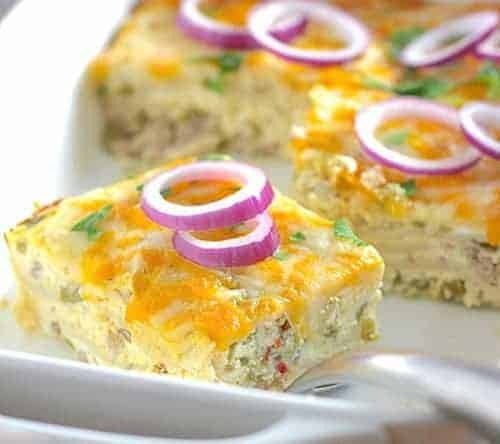 This Mexican Breakfast casserole from Laughing Spatula was a perfect main dish and we had toppings galore with sour cream, cilantro, diced tomatoes, chopped avocado, hot peppers, and homemade salsa. I followed this recipe closely except I added a layer of frozen spinach (almost thawed) to the bottom of the pan. Groovy Girl always orders omelets with spinach so I figured this was a good twist. I knew I wanted my second dish to be sweet and I browsed through many recipes on line and in my own cookbook cupboard. Many with apples seemed too Fall-ish and G.G. is not the biggest fruit lover. Watermelon is her favorite and that does not pair well in any baked dish that I know of. She does love bread though and I happened to find just what I was looking for in "Not Your Mother's Casseroles" by Faith Durand. I've used many recipes from this book but never made this particular one. I really wanted my daughter to swoon with joy with my brunch choices and this one did it. Preheat the oven to 325*. Lightly grease the baking dish with butter or spray. Layer half the bread in the baking dish, overlapping and wedging them in tightly so they are in an almost solid layer. To make the custard, whisk the eggs until fully beaten, then whisk in the milk, sugar, vanilla, cinnamon, nutmeg, and salt. Pour half of this custard over the bread in the baking dish, letting it settle in and soak the bread thoroughly. Set aside the rest of the custard. Sprinkle with extra cinnamon. Bake, uncovered, for about 50 minutes, or until it is firmly set. Cool for 15 minutes, sprinkle with confectioners' sugar, and serve. I skipped the powdered sugar-it didn't need that extra sweetness. I did generously douse it with cinnamon though. Also a few years ago I downsized my kitchen and I only have one 13 X 9 -in pan so I made this breakfast bake in my slow cooker. Perfect! It worked so well I would do it this way again. I made the cream cheese filling on Saturday night (after I'd made the Mexican egg dish and it was resting in the refrigerator" and then I layered the bread, custard, and filling into the slow cooker and let it soak for about an hour. We turned it on low before we left for church and it was piping hot when I returned two hours later. We also had a strawberry spring greens salad and grits slow cooked with gouda right before guests were to arrive and strawberries mixed with a sprinkle of sugar just like my grandmother served in the springtime when she said the berries were still a little tart. My son loves them just that way. My friend brought a dish or squared watermelon and we had glasses of mimosas to clink. It was lovely and I have not one photograph of the table. Happy guests though and a happy girl / young lady. Peace be with you.